Drifting a Yarnie along the meadow’s edge. This may sound strange but when I’m fishing with a guide, I’m much more interested in the education they can provide than actually catching fish. I rate the value of the day not on the number of fish I caught, or the size, but the amount of information that was shared and the quality of the instruction that was provided. Of course, friendly banter is always appreciated and favored. I also don’t mind watching a guide fish while on the clock either. Being trained and working in visual arts, I rely on my power of observation for problem solving – at the very least I obtain a visual picture of what I’m trying to achieve. If I walk away feeling as though I improved my angling skills, I’m a satisfied customer, regardless of how many fish I caught. Knowledge lasts a lifetime, and there will always be fish to catch. 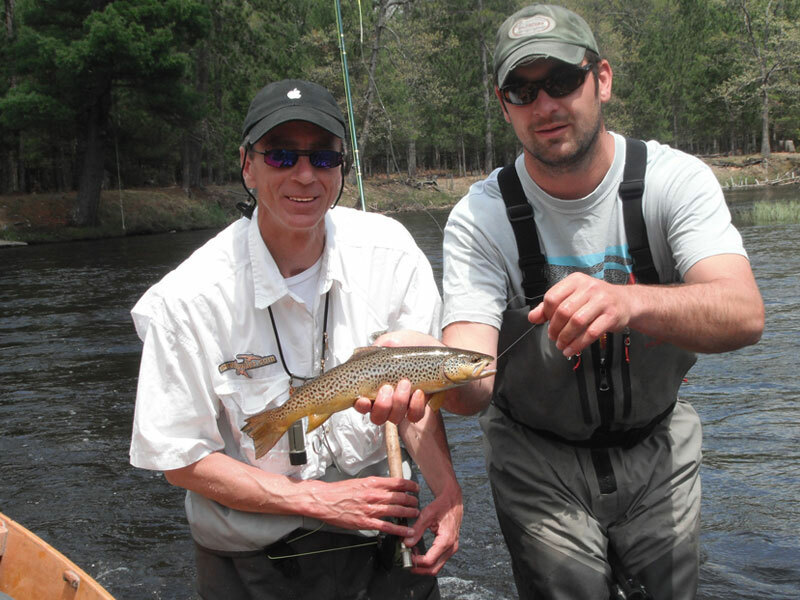 Floating the Au Sable River, in Grayling MI, is an angling experience that earns it’s way onto the bucket list of many fly fisherman. The hatches on the river have a historic reputation and spending the day riding in a twenty-foot long cedar skiff is an absolute adventure in nostalgia. As an avid down and across wet-fly angler, my skill sets for dry fly angling are always rusty – I just don’t do it often enough to polish the varying techniques. 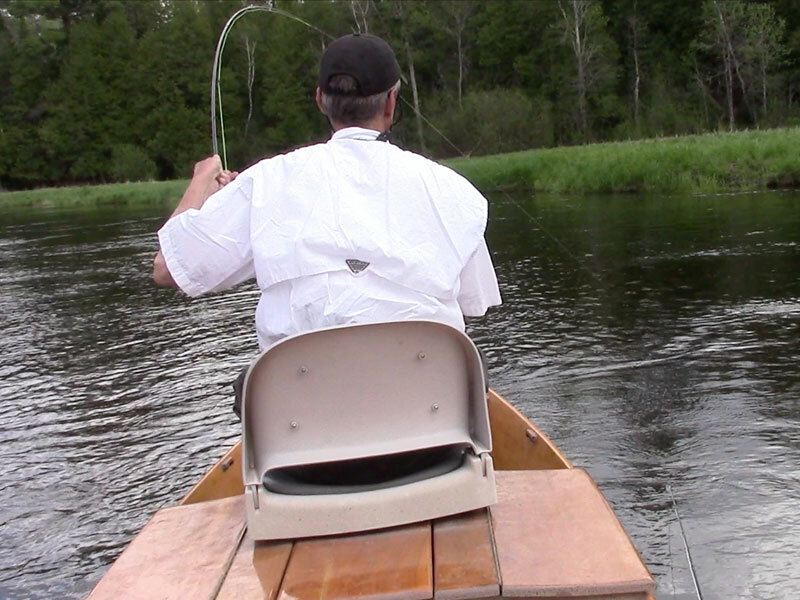 Thankfully, this didn’t impair my ability to achieve epic, drag free drifts – thanks to superior boat handling of our guide, Jamie Clous – out of the Old Au Sable Fly Shop. Any fly fisherman who has mended across a current understands that some water moves fast and other water slow. When two fishermen in a skiff are casting into the faster moving, insect super highway (foam line) the skiff can’t simply sit on the same seam and roll down that lazy river. If you ever wonder why a guide shouts at a strike before your body can react to it, it’s simply because they are concentrating on your fly and line as they are constantly repositioning the boat to keep it all floating drag free. If I were of the ilk that easily prescribed to conspiracy theories, I would not need six degrees of separation to link his guide prowess to the siren-like song of the drift. I’m convinced his entire guide strategy is to lull you into a false sense of excellence that eventually results in deep-seated feelings of angling inadequacy. While I considered the two days fishing a graduate course in the importance of boat handling and positioning, I feel I am due at least a tiny bit of retribution. In retaliation I have no choice but to expose one of his well-protected guide secrets to the 3 or 4 people who actually read my blog. 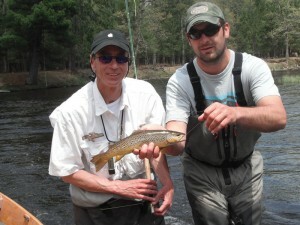 If you should ever find yourself on the Au Sable river, between the dark and light Hendrickson hatches, you will discover that respectable brown trout have a propensity for a fly called the “Yarnie.” This extended, wool-bodied stone fly rides low in the film, can catch some drag and be skittered without sinking and the fish love it — I mean really love it. If you are not a tier, you can visit the Old Au Sable Fly Shop and pillage their stock. 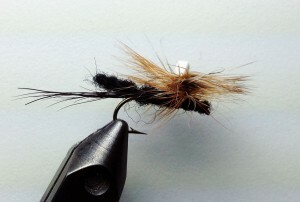 In any event, be sure to have them in your box on any river large stone flies are present. You will not be disappointed. Post: White foam post or grizzly and ginger hackle tips. Body: Yarn with extended body twist.